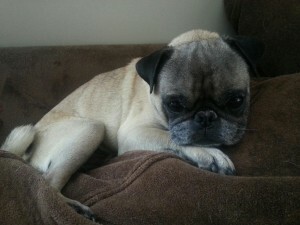 Remington (Remi) is a very cuddly pug that loves to lay around with his foster family. He follows you everywhere and loves being in the sun. He does need to wear a belly band around the house for occasional marking, but is otherwise potty trained for outside. He doesn’t even notice the band and doesn’t mind when you put it back on when he comes in. Will stay in the crate, but prefers to stay out if you will let him.